I really enjoy having hand print crafts hanging in my front hallway for different seasons. For Halloween we did "Trick or Treat; Smell My Feet" and then I did a Valentine's Day/Spring Love Handprint collection to celebrate the birth of my second child. It is time for the next craft to make some imprints of my little boys. When I was working to decorate Rowdy's room, I ordered a stunning dinosaur print that was supposed to be 16x20". I purchased a white 16x20 frame and waited for the print to arrive... and alas the print actually measured 16x21". Not only does this mean I need a custom frame for Rowdy's room, but I have an extra WHITE frame that I have no use for. What can I do with it? 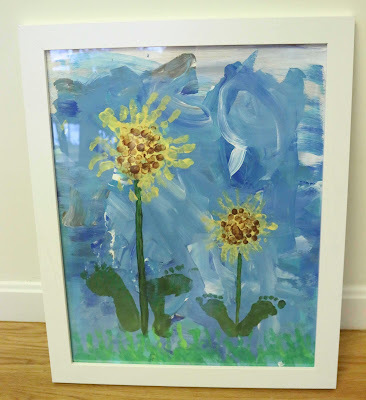 Re-purpose it for handprint art! I'm taking the cardboard back and I'll turn it into a summery sunflower field... at least this is the plan. I envision handprint petals and thumb print centers... but we'll see how much I'll be able to do with the boys. To start, I don't want a boring brown background. I think it should be blue and white like a clowdy sky. This is where 2.5 year old Lucky comes in. One afternoon I set us up with a bunch of blue and white paints and had him help me paint the back. I did a light coat on the back of the paper so that most of the brown will be covered. I can't expect a 2 year old to cover the entire background so why not give a rough abstract gradient to start with? I just put some paint in 3 shades of blue and 1 white and brushed them out. Next, I set up Lucky with some paint in the blues, white and gray and let him go to down with a sponge brush. Lucky's painting is BEAUTIFUL! I had to rotate the canvas so he could reach it all from his high chair but he covered the majority of the background up. It was hard to wait for this to dry before we started doing the handprints. Lucky and I practiced the handprint sunflowers on some construction paper (Mother's Day presents for Mimi and Grandmama!) before making the one on our "canvas." We did at least 6 hand prints in a circle, rotating the work of art to get the petals to fan out. It is REALLY USEFUL to have another adult on hand so one adult can help with the hand placement while the other keeps the canvas from falling to the ground. Once the sunflower was dry, we then added the next layer of paint: Thumbprint "seeds" and some hand print grass along the bottom. I helped Lucky with the thumbprint placement since it was hard for him to reach across the table. He really understood what we were trying to do and could do this on his own if I were willing to let go some control of this project. When we finished the thumbprints he was playing painting his hand and making prints on scrap paper. Super cute! Rowdy's handprints were much harder to do. How do you get a 3 month old to hold his hand open? Keith held up Rowdy's body while I used both of my hands to paint and then hold them open on the paper. It didn't matter if I couldn't get a good hand impression since the sunflower is the sum of many fingers going in a circle. In the end I even did just some finger prints to even out his sunflower where needed. I struggled with how to do the stems on this project. I knew I wanted to do footprint feet on the bottom but the stem should really be drawn first. In the first try I used a really dark green for the stem but it looked too stark on the dimensional background. I lightly painted a paler green on top and was much happier with the mix. I considered curving the stems but I didn't want to take away from the footprint leaves. Rowdy's thumbprints were NOT EASY to do. We couldn't get a good angle and then we tried a toe print and he started freaking out. He made (well, it wasn't his fault, really) some smudges so I did my own pinky prints. I could have had lucky do them but he had already been cleaned up from paint and I didn't want to start all over again! We tried to do Lucky's footprints a little differently than usually and smudged it a bit, but it is still fantastic. WE LOVE IT! Smudges and all it is a fun project from my baby boys. Finally, all I needed to do was put this print in the frame and admire the adorable picture I created with my boys. Some people think that handprint art isn't beneficial to preschoolers because they are following a prescribed path versus doing creative art exploration. Rowdy is too young to understand any of this, but Lucky has so much fun seeing what we can turn his handprints into and looks at them with pride. I love these projects because I look back on creating them with my boys, but I am not delusional enough to think that THEY made these for me. I made them for me, with their help. I proudly hang Lucky's scribbles on my walls, too. I cannot wait to see what both boys will grow to create!